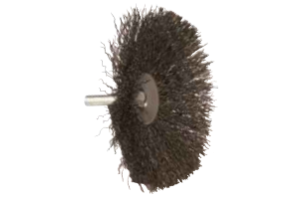 Our shank-mounted Conflare brushes are manufactured for tough cleaning jobs on internal and external surfaces. The wire angle eliminates flaring during operation, while providing a less aggressive action and longer brush life compared to other circular styles. We offer 16 standard Conflare brushes in carbon steel, urethane encapsulated carbon, stainless steel and urethane encapsulated stainless steel filaments in several sizes and diameters. 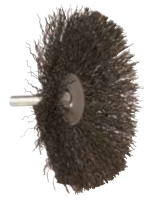 These brushes are ideal for weld and carbon removal, deburring and plastic flash removal. These brushes are highly effective for side cleaning, while eliminating bottom scoring.